Nanometric-scale sensors that have the potential to enhance the functioning of atomic force microscopes have been printed by EPFL researchers. Small sensors developed through nanoscale 3D printing may be the foundation for the future generation of atomic force microscopes. These nanosensors can improve the detection speed and sensitivity of the microscopes by miniaturizing their detection component up to 100 times. For the very first time, the sensors were used in a real-world application at EPFL, and the findings are featured in Nature Communications. Atomic force microscopy is based on a powerful technology with a performance similar to a miniature turntable. A small cantilever with a nanometric tip travels over a sample and detects its relief, atom by atom. The infinitesimal up-and-down movements of the tip are captured by a sensor in order to determine the topography of the sample. Miniaturizing the cantilever is one way to enhance atomic force microscopes and it also reduces inertia, speeds up detection, and increases sensitivity. This was achieved by researchers at EPFL’s Laboratory for Bio- and Nano-Instrumentation. These researchers furnished the cantilever with a 5-nanometer thick sensor developed with a nanoscale 3D-printing technique. Using our method, the cantilever can be 100 times smaller. It is possible to measure the up-and-down movements of the nanometric tip through deformation of the sensor positioned at the cantilever’s fixed end. However, the researchers had to pull a trick out of their hat as they were handling small movements - smaller than an atom. 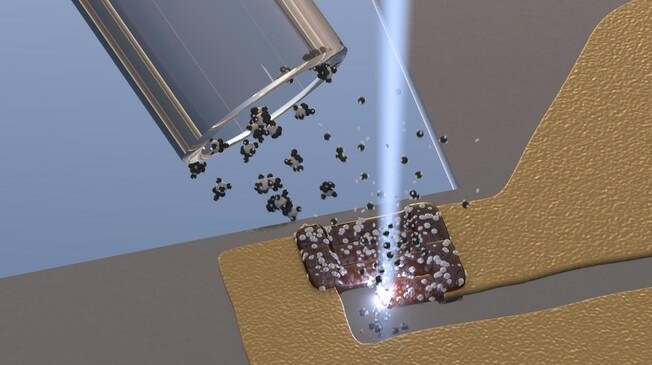 The researchers collaborated with Michael Huth’s lab at Goethe Universität at Frankfurt am Main and came up with a sensor developed from highly conductive platinum nanoparticles surrounded by an insulating carbon matrix. The electrons are isolated by the carbon under regular conditions. However, a quantum effect comes into play at the nano-scale: a few electrons jump through the insulating material and pass from one nanoparticle to another nanoparticle. It’s sort of like if people walking on a path came up against a wall and only the courageous few managed to climb over it. The nanoparticles move far away from each other and the electrons leap between them less frequently when a change takes place in the sensor’s shape. The sample’s composition and the sensor’s deformation are thus revealed by the changes in the current. The real challenge faced by the researchers was in identifying a way to develop these sensors in nanoscale dimensions while cautiously monitoring their structure and also their properties. In a vacuum, we distribute a precursor gas containing platinum and carbon atoms over a substrate. Then we apply an electron beam. The platinum atoms gather and form nanoparticles, and the carbon atoms naturally form a matrix around them. By repeating this process, we can build sensors with any thickness and shape we want. We have proven that we could build these sensors and that they work on existing infrastructures. Our technique can now be used for broader applications, ranging from biosensors, ABS sensors for cars, to touch sensors on flexible membranes in prosthetics and artificial skin.